The release of Deadpool 2 brings with it a great many things. Lots of new jokes, a ton of new actions sequences and lots of surprises for fans. But Ryan Reynolds' sequel is actually managing to break new ground within the comic book movie genre that has nothing to do with its R-rating or fourth-wall breaking. The highly-anticipated sequel is actually able to put a pretty distinguishing feather in it's otherwise foul, fun and violent cap. Warning: spoilers ahead for Deadpool 2. If you would prefer to go into the movie as blind as possible, you may want to circle back to this after you've seen it. Moving on. Negasonic Teenage Warhead (Brianna Hildebrand) returns this time around, but she's progressed quite a bit as a character. In addition to becoming a more active and involved member of the X-Men, she also finds herself in a relationship with a fellow female mutant by the name of Yukio (Shioli Kutsuna). Yes, Deadpool 2 features the first openly LGBTQ relationship in a Marvel movie. GLAAD President and CEO Sarah Kate Ellis has come out to praise the decision by Fox and the creative team to include this relationship in the movie, calling it a milestone. Here's what she had to say about it. "20th Century Fox have finally given countless moviegoers around the world what they've longed to see- LGBTQ superheroes in a relationship who protect the world together. 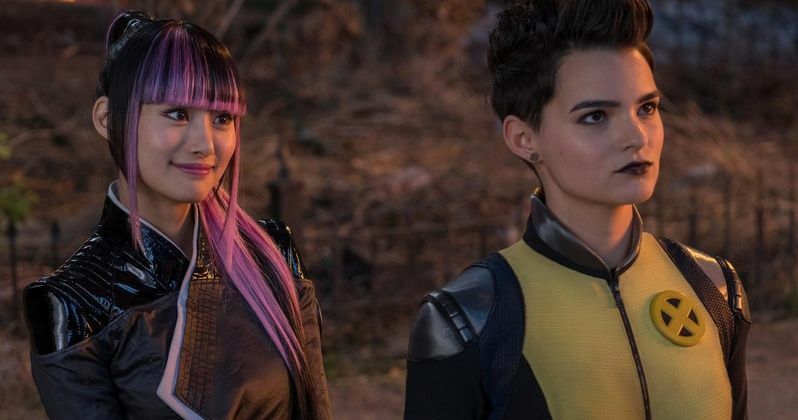 Negasonic and Yukio's storyline is a milestone in a genre that too often renders LGBTQ people invisible, and should send a message to other studios to follow this example of inclusive and smart storytelling. While comic books and superhero shows have seen a welcome increase in LGBTQ characters. those characters, or their LGBTQ identities, have often not yet made it to the big screen." This makes Deadpool 2 not just one of the most highly-anticipated movies of the summer, but a very important one. Comic book movies like Thor: Ragnarok and Black Panther had LGBTQ storylines built in, but Marvel Studios decided to back off a bit and subvert those plot elements ahead of their release. Deadpool 2, on the other hand, makes it very clear that Negasonic and Yukio are in a relationship, which is significant. But part of what makes it so groundbreaking is that the movie doesn't make a big deal out of it. It's treated as any other romantic relationship in a movie might be. Deadpool managed to break some ground by proving that mainstream, R-rated comic book movies can work in the modern landscape. Deadpool 2 is making a major step forward by showing LGBTQ relationships in what will likely be one of the biggest movies of the year, not just domestically, but worldwide. This isn't some arthouse, indie flick. This is a major, big-budget blockbuster. Where movies like Beauty and the Beast may have chickened out to some degree when it came to representing these types of characters on screen, somewhat amazingly, it was Deadpool 2 that broke down this barrier. The fact that GLAAD has come forward to show such strong support of a movie such as this is no small thing. Will this give other studios and filmmakers the confidence to follow suit in the future? We shall see.